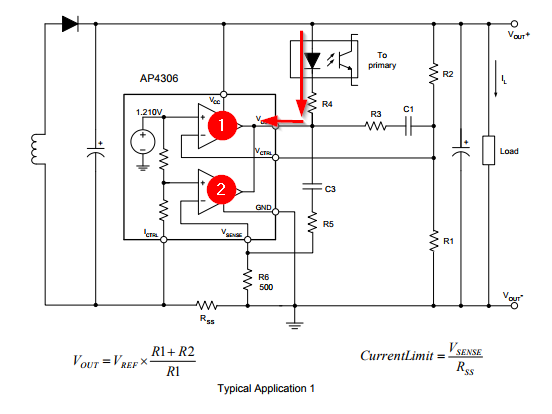 AP4306 has paralleled two op amps in it's block diagram, is that possible? Thank you for taking some time to read this. I've recently come across a nice constant voltage/current source (http://www.mouser.com/ds/2/115/AP4306A_B_C-271586.pdf) called an AP4306. Upon reading its datasheet, I was interested in the fact that it could potentially (I think) be used as a voltage comparator with a built in voltage reference. I'm putting together a over-discharge circuit for a lithium polymer battery which will be done with a voltage reference, voltage divider, MOSFET, and an op amp. Let me know what your thoughts are if you'd like, thank you for your time! The data sheet states that the outputs that can only sink current. This is very common for comparators to have open-drain(or collector) outputs. Since they only sink current they do not have normal opamp push-pull outputs and it is acceptable to tie them together. It also means that there must be an external current source feeding the output - normally this would be a resistor pull-up to the positive rail of the power supply. The datasheet doesn't explain it but a look at the load gives us a clue. Figure 1. From AP4306 datasheet page 2. Note that the load is the opto-LED which is powered from Vout+. The amplifiers (1) and (2) never have to source current. This means that open collector outputs can be used on the opamps. Open collectors can be paralleled to form an OR gate. In this case if either output 1 or 2 turns on the LED will turn on. 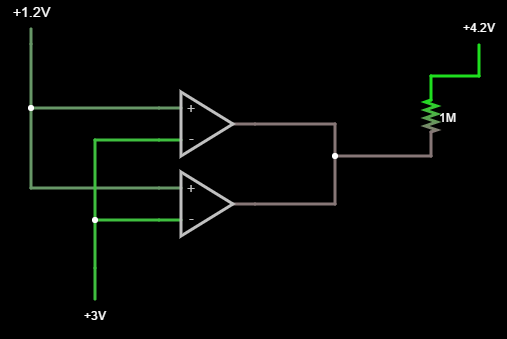 If amplifier 1 inverting input ever goes above 1.210 V its output will pull low turning on the LED and (presumeably) switch off the SMPS switcher as the voltage is now >= setpoint. 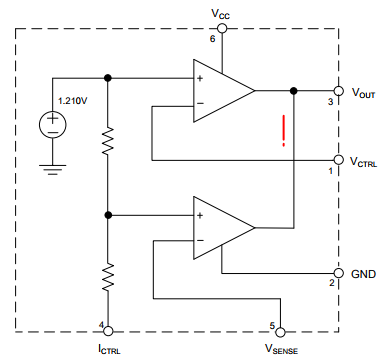 If the current exceeds the current limit threshold the voltage at the inverting input will exceed that on the non-inverting input and it will turn on the LED limiting the power delivered. I can't see any DC feedback on the circuit so the opamps seem to be used more like comparitors. Not the answer you're looking for? Browse other questions tagged operational-amplifier parallel short-circuit lithium over-discharge or ask your own question. How do I use Lithium Polymer batteries in a very high draw system without tripping the overload protection? Can 1.5v Lithium AA batteries be recharged? Are the specifications of this lithium polymer battery believable? Why does an op-amp in this simulation not produce a large voltage swing? Arduino inductance meter using op-amp as comparator?